Transfer from airport/hotel to port and embarkation from 18h00. Meeting point at the tavern “Limanaki” at the entrance to the marina Vlichada. Welcome aboard of the sailing yacht. Possibility to visit the village of Fira with a spendid view to the Caldera. Dinner at the tavern in the evening. Santorini / Oia / Ios – 25 miles (5 hours of sailing). A unique experience: sailing in the Caldera of Santorini (ancient collapsed crater). Lunch at noon at the foot of the village of Oia. In the afternoon arrival at Ios island where Homer is buried … From a deep bay, you will discover on the summit Ios’ beautiful Cycladic village with the same name as the island and called Nios by the locals …. 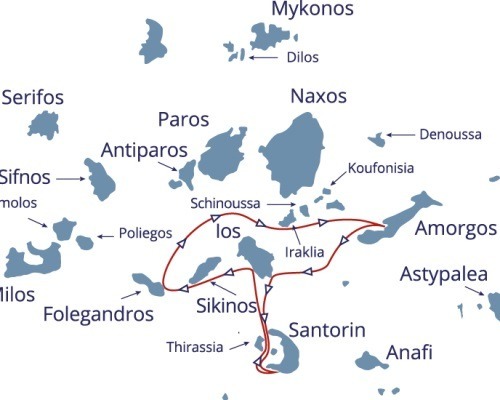 Ios / Folegandros – 20 miles (4 hours of sailing). In the late morning departure to Folegandros, anchoring in the little port Karavostati At the top of the hill you will discover the picturesque Cycladic village Chora. Don’t miss a visit to its church dedicated to the Virgin Mary, its medieval castle Kastro and its impressive cliff line. In the evening dinner in a lively tavern at Chora. Folegandros / Sikinos / Small Cyclades – 20 miles (4 hours of sailing). Sailing downwind close to Sikinos and anchoring around noun in a small bay with swimming and meal on board … Heading to the Small Cyclades – a group of islands in the south of Naxos, Iraklia, Skinoussa, Koufounissi…. Anchoring and excursions at these islands barely touched by tourism, wild bays and magnificent beaches of fine sand and crystal clear waters. Small Cyclades / Amorgos – 25 miles (5 hours of sailing). Amorgos – Island of the “Big blue”, arrival in mid-afternoon at the Port of Katapola. Visit of the village of Chora, which dominates the vast bay of Vathy. Do not miss the monastery of Haroviotissa clinging to the cliff south-east of the island, a nice walk with a fantastic panorama. Amorgos / Ios – 20 miles (4 hours of sailing). In early afternoon sailing to the beautiful beach Manganari in the south of Ios and mooring in the bay at night. Dinner on board or at the tavern. Ios / Santorini – 30 miles (6 hours of sailing). Sailing to the island of Anydros. If the weather conditions are good: anchoring and swimming. Back to Marina Vlichada at Santorini, possibility of organizing a visit of the wine-cellar at Pirgos and tasting of the famous wines with a long tradition (1700 BC) as Vinsanto the Assyrtico the Nykteri …. Tidying up the boat, disembarkation around 10h00 and transfer to hotel/airport. Consumptions bar, vehicle rental, tours of sites and museums are not included in the board kitty. Monohull yachts from 40 to 55 feet, well maintained and in top condition with an emphasis on comfort and security with 3-5 double cabins (with double bed or bunk beds). There are no triple cabins. Maximum 8 persons + the skipper. Each participant is fully part of the crew and can participate in steering the boat and in life on board. Departures are guaranteed for a minimum of 4 participants. It’s possible to combine cruises in case the required minimum has not been reached.